Paper bags are excellent advertising mediums, and could be promoting your brand as your customers walk down the street. These promotional products have a spacious print area, which allows your branding to ake an impact. 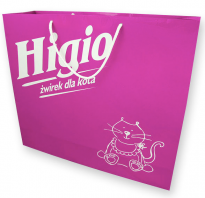 You full colour print can be applied in 360 degrees, wrapped around the bag. This means that your branding will be seen from multiple angles, expanding your advertising reach. The handle of these paper bags can also be created in 12 different shades, for a more stand out look.